Most of the titles in this collection are prepared to work interactively with both Tanakh: Interactive Hebrew Bible and Hebrew-English Tanakh: the Jewish Bible which can be purchased separately. Interactive collection of biblical commentaries authored or edited by two of the most influential Biblical scholars of the 20th century, one Christian and one Jew, Samuel R. Driver and Umberto Moshe Cassuto. 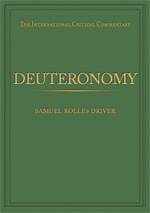 SAMUEL ROLLES DRIVER, an English Christian Hebraist, who was one of the foremost champions of Biblical criticism. Driver has always taken a conservative view, showing much moderation and sympathy with the orthodox position; he was often attacked both from the Left and the Right in his field. UMBERTO MOSHE CASSUTO (Moses David; 1883–1951), Italian historian, scholar of Bible and Semitics. While appreciating the scholarly basis of Higher Criticism, he opposed the Graf-Wellhausen documentory theory. His expositions focused on the existing text, analyzing its spiritual and ethical teachings, pointing out its literary devices, and discussing its exegetical problems, on which he brought to bear comparative literary and linguistic material whenever possible. Below are 1 - 12 of the 12 items	sorted in "A-Z by Title" order.